Norka was a successful colony by 1834. The 1834 Census shows 445 families comprised of 4,113 people living in Norka. Clearly, the colonists were becoming successful and the population was growing rapidly. This rapid growth prompted concerns about the shortage of arable land. By the early 1850's, measures were taken to establish new daughter colonies in the region to alleviate this pressure. A copy of an original page from the 1834 Census of Norka. Mai, Brent Alan. 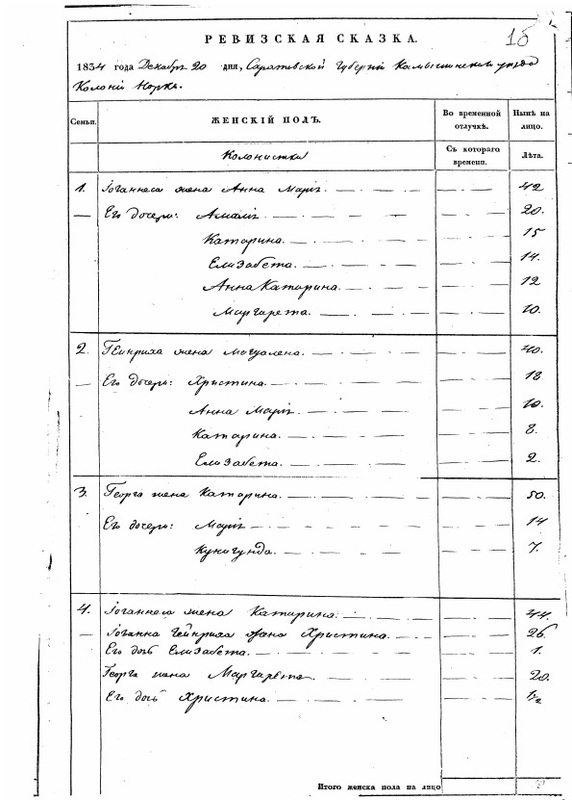 1834 Census of Norka in the District of Saratov, Russia, Dated 20 December 1834. Beaverton, OR: Dynasty Pub., 2007. Print. Last updated May 5, 2016.